Tonight we are celebrating the anniversary of the ratification of the 19th amendment, which grants women the right to vote. 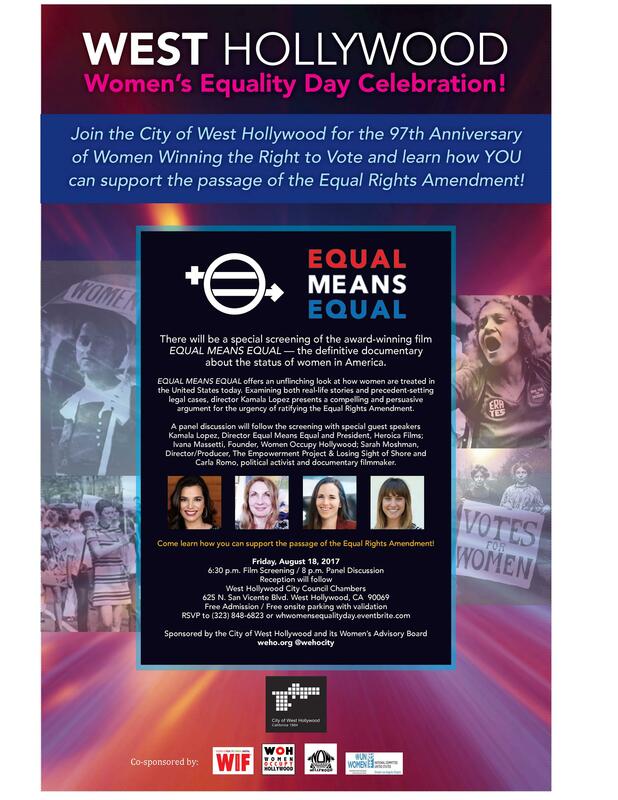 Thank you to the City of WEHO for giving us the opportunity to get together and watch the important film Equal Means Equal, by the director/activist Kamala Lopez. 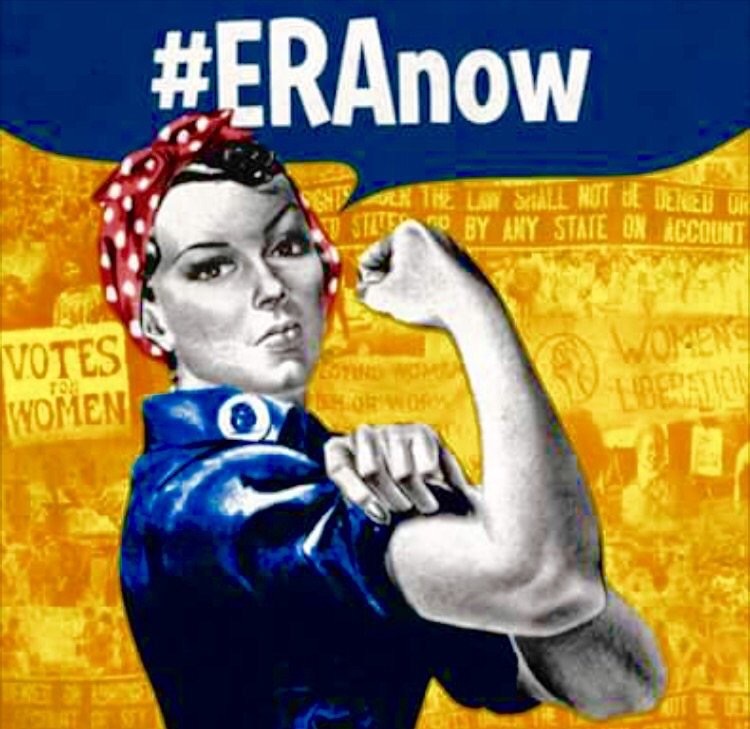 As you saw in the film, the ERA did pass in 35 States, now 36. A unique voice. A unique filmmaker. A unique background. A unique mind. This is VANESSA HOPE, the writer, director and producer of the documentary “ALL EYES AND EARS”. The documentary follows the Mormon former Governor of Utah, John Huntsman, in his four-year term as American ambassador in Beijing, China. The ambassador’s story is intertwined with interviews of his adopted Chinese daughter Gracie Mei and blind Civil Rights leader/advocate Chen Guangcheng. Two men and a girl. Where the men represent the two main faces of the world, the girl represents the future, the question not the answer. Nothing is black and white in this tale. There are many shades of gray, certainly more than fifty. My name is Ivana Massetti and I’m the founder of Women Occupy Hollywood. I’m a writer-director-producer of films and television. 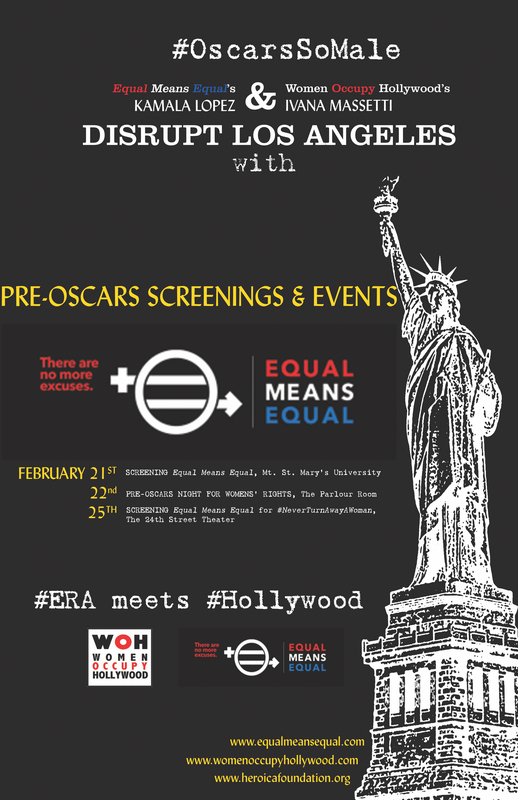 I was always a feminist and an activist, but I decided to do more for women when I witnessed first-hand the cruel gender inequality that plagues the movie and TV industry in Hollywood. Women are almost completely absent from the cultural NARRATIVE in this country. Only 4% of the top 1,114 Hollywood films in the past 10 years were directed by women, despite the fact that 50% of film school graduates are WOMEN. In other words, there is no issue of availability or capability of women that justifies that number. On January 21 We Marched. On March 8 We Strike. On March 8 We Support a #DayWithoutAWoman continuing our partnership with the Women’s March on Washington and the Women’s March all over America. On March 8 We Stand Up and We Strike. On International Women’s Day We Celebrate Women All over the Country & We Stand Up for Women’s Rights. Our Rights. Amy Adrion is the director and producer of the documentary “HALF THE PICTURE” about gender bias against women directors in the entertainment industry. She started her film ten months ago when the debate about women directors was extremely hot. Now we are at the end of 2016 and the data revealed by several institutions is still very depressing. It looks like not so much has changed despite the noise. So many programs, panels, studies, summits are dedicated to this topic but women directors are still largely unemployed. We don’t know the results of the EEOC investigation yet and we look forward to hearing them. Before that night when I sat down at the Soho House for the screening of the film “MR. CHURCH”, I had spoken with Susan McMartin just once. During the Tribeca Film Festival we had a conversation on the phone regarding the script she had written ten years earlier becoming a film with such a huge star as Eddie Murphy as the protagonist. On the phone I had already gotten a glimpse of a special person and a gifted writer, but I wasn’t ready for what happened that night in that exclusive screening room when the lights went off and the opening credits of Mr. Church started to scroll down the screen. This week WOH supports two films by two women directors from two different countries, one is BANG GANG by the French director EVA HUSSON and the other is PARCHED by the Indian director LEENA YADAV.